Step into the foyer of the Basin Harbor Club in Vergennes, and you may feel like you've entered a Henry James novel. The lobby walls are decorated with pictures of gangly wooden sailing rigs. The dining hall, with its quaint furniture, player piano and views of a shimmering Lake Champlain, makes you want to order a crumpet. In short, it's the ultimate portrait of upscale leisure. Around noon on a recent sunny day, the clubhouse lobby brims with guests. Those who aren't dressed in tennis whites wear tasteful pastels and khakis. Mid-July offers scads of pleasant diversions to strike one's fancy. A bulletin board advertises a dog-walking service. Over by the "Breezeway" gift shop, an elderly couple examines a series of unremarkable watercolor paintings. It seems no one is in a hurry to do anything - employees included. This relaxed atmosphere suggests Basin Harbor is not only a pleasant vacation spot but a pretty nice place to work. Yet, according to club owner Penny Beach, the main dining hall was seriously understaffed for a few weeks in late spring, for the first time since 1886. That's because a handful of Beach's workers were delayed on account of visa paperwork. Since the 1950s, Basin Harbor had sporadically employed workers, some of them political émigrés, from other countries. About a dozen years ago, though, faced with a dearth of local labor, Beach decided systematically to hire foreign workers to clean rooms, answer telephones and cook meals at her club. That first year, she recruited about 10 workers from Jamaica. Now, at least 15 percent of her 300-plus staffers hail from places as far as Moldavia, Kazakhstan and Cameroon. Of all the countries, though, Jamaica still prevails, with more than 20 employees. Two of them are David and Lenox Williams - who are unrelated, though they share a last name. Jovial and laid-back, the men have worked five months a year at Basin Harbor since 2001 and 2003, respectively - except for one year, when Lenox's H-2B visa wasn't approved. Today, they've agreed to talk with a reporter about why they've chosen to make Vermont a home away from home. Their comments offer an "insider" perspective on the ongoing, and often heated, debate over temporary guest workers in Vermont. "Guest worker" has become a buzzword in the national lexicon. The presence of employees such as the Williamses in Vermont speaks to larger, hot-button issues such as immigration, labor and foreign policy. This past year, the nation's attention was focused on a comprehensive immigration bill that would have significantly expanded the existing federal guest-worker program, which in 2005 allowed U.S. employers to hire about 121,000 foreigners to do jobs Americans can't or won't do. Thirty-two thousand of those jobs were in agriculture - a figure that may or may not include about 2000 Mexican migrants who work on Vermont dairy farms. The other 89,000 jobs fell under categories such as landscaping, construction and hospitality. Last month, however, the bill collapsed. Vermont Senators Bernie Sanders and Patrick Leahy were in the middle of the debate - on different sides of the table. Leahy supported the bill; Sanders didn't, claiming it would have hurt American workers. In fact, the latter has made headlines recently by calling for a federal Department of Labor investigation into Killington resort, where he suspects locals are being replaced by guest workers. Regardless of any specific bill or controversy, it makes sense for Vermont's congressional delegation to have a vested interest in the guest-worker issue. This state has the oldest workforce of any in the U.S. - the median worker age is 42.3 years. The dearth of strong, capable hands has been felt in some quarters, including dairy farms and resorts, for some time. That pinch is likely to get worse in years to come. At Basin Harbor, the Williamses - David, 31, and Lenox, 35 - lead a reporter out of the clubhouse, across the lawn, and into a gray gazebo that overlooks Lake Champlain. A few yards away, guests recline in brightly painted Adirondack chairs, reading newspapers and paperbacks. By contrast, David and Lenox look all business. David still has a meat thermometer in his pocket. From their uniforms, it's clear the pair has time for only a short break from their long work day. You'd never guess it from their unhurried voices, though. As the conversation gets rolling, the men speak in lyrical rhythms that complement their surroundings. At $363 dollars per night, Basin Harbor is an out-of-reach vacation spot for most Vermonters - that's more than half an average state resident's weekly salary, according to the Department of Labor. How did it look to two guys from the Caribbean when they first arrived? Lenox laughs. "It was like a culture shock when I came here," he says, echoing a common sentiment among first-season workers. "I was taken aback by how far away the nearest 'corner' store was. I rode all the way to Vergennes and back on my bike - that was quite a hike!" The men's initial sense of displacement is understandable, considering they come from more than 2000 miles away, across quite a cultural divide. "On the flight, I didn't see anyone who looked like me. I thought I was on the wrong plane," David confides in his lilting accent. "When I came, all I heard was woods, insects . . . chirpin'. I wanted to leave." That feeling dissipated pretty quickly. David, who has also worked at a resort in Florida, says Basin Harbor administrators help smooth first-year transitions. David and Lenox agree they don't have the best salaries - both make about $8 per hour, which translates to between $8000 and $10,000 for five months of hard work. That's before taxes and after a $240-per-month housing deduction. Still, judging from its 70 percent staff-return ratio, BHC must keep its employees reasonably happy. "This is the only place I've worked where you see people cry before they go back home," David reveals. "Once you're comfortable in the environment, the pay's not the issue." 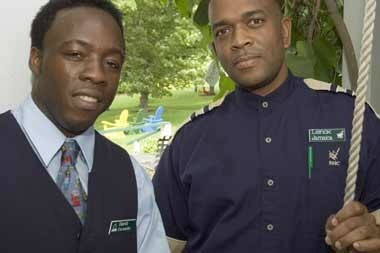 The Williamses acknowledge that getting used to the work environment here can be tricky, in part because some Jamaican social norms just aren't accepted in the U.S. For instance, David and Lenox have learned not to call guests "beautiful," since the word might elicit claims of sexual harassment. What if guests flirt with them? "There are certain things you don't do with guests," Lenox declares. "We have our professional way of shutting it off," David affirms sharply. Club owner Penny Beach concedes that cultural differences can pose obstacles, but she says that all her employees undergo some kind of etiquette training. "It's not only people from Jamaica who have to learn," she notes. "It's people from everywhere. It's people from Vergennes. It just sort of comes with the territory - I'm sure that any hotelier . . . would tell you the same thing." That's not the only point they might agree on. This Monday, Beach was one of several Vermont "hoteliers" who met with Senator Sanders in his Burlington office. Sanders is backed by the prominent labor union AFL-CIO, which is concerned about the potential loss of American jobs. Accordingly, the senator proposed an amendment to the immigration bill that would have raised fees for employers seeking to recruit guest workers. On the other side of the debate, Beach's delegation contends Sanders isn't looking out for its interests. According to Beach, who runs the Basin Harbor Club with her brother Bob, the increasing number of foreigner workers there does not reflect an anti-American bias. Rather, she's hiring them because no locals are willing to do the work. Though Beach appreciates the diversity her guest workers bring to the resort, she declares the H-2B program a logistical headache. In addition to filling out reams of paperwork, she's required to pour thousands of dollars every year into Burlington Free Press advertisements - almost none of which generate new hires. "I would love to hire all American," she comments, adding dryly, "If I could find them, I would hire them." The Williamses confirm her assertion. "Some of the local workers say that Americans don't do 'beds and dishes,'" Lenox reports. David adds sympathetically, "If I lived here, I wouldn't be thinking of a seasonal job." As it happens, he now lives in Canada half the year with his wife, a Canadian legal assistant. This spring he worked, with benefits, for a financial firm in Toronto. At Basin Harbor, the taxes on his paycheck that are earmarked for Social Security and Medicaid simply disappear. As the conversation shifts to the controversial guest-worker program, David and Lenox tense up, then glance at each other knowingly. It's as if they're being asked to talk about their medical histories. That makes sense: Their jobs at Basin Harbor, paradoxically, are both tickets to economic opportunity and symptoms of financial instability. "In certain cases, it does put your life forward," David says of the H-2B program. As for the lack of benefits, he says, "We just accept it . . . I try not to think about it." Lenox adds, "You cannot dwell on it, or you'd be preoccupied with the negative, not be able to function in your job." According to these veteran guest workers, critics such as Sanders don't recognize how much good the program does. In addition to the revenue H-2B pours into U.S. coffers, they say, it helps foreign workers make investments back home. According to the World Bank, 40 percent of Jamaica's population were émigrés in 2005, and 20 percent of the country's gross domestic product came from "remittances" - money earned abroad and reinvested locally. The guest workers' presence also appears to boost local economies in Vermont. Andy Megroz is the ruddy-faced, white-haired proprietor of Mountain Valley View Panton General Store, which is located a few miles south of BHC on Jersey Street. Both David and Lenox mention his store as an important resource. That's because the shopkeeper special-orders items such as Red Stripe beer and Jamaican spices for the summer season. Megroz says he's become friends with some of the men, with whom he occasionally watches baseball. The friendship extends both ways. Jamaican workers at BHC, Megroz says, often refer guests to his store. In recent years, they've invited him to their annual Jamaican Independence Day cookout at the club in August, where they serve beer and curried goat. "It's kind of nice to be included in some different things," Megroz notes. The Jamaicans "have been excellent clientele, and they're very supportive people. It's an everybody-looks-after-everybody kind of situation." The Williamses suggest that a summer in Vermont entails an almost diplomatic responsibility. My job "gives us the opportunity to prove to others from all nations and all walks of life that we are not what people think we are," David asserts. "People assume Jamaicans are aggressive, but when they get to know you, they see that's really not true." To illustrate his point, he recounts a subtle phenomenon that has rubbed off on the BHC staff: the Jamaican custom of hugging on meeting. My co-workers "have grown so accustomed to hugging that whenever you show up . . . that's something you have to do," David asserts with a boyish grin. "A lot of people don't know that the hug is very important." As the interview comes to a close, the men pause to gaze out at the water before heading back to work. Children are playing on a dock, and their happy vibe seems to spread across the lawn. "We are like a family here," Lenox says, smiling, "from the owners all the way down to the last person." Club owner Penny Beach agrees. She suggests that, paperwork aside, her guest workers leave an indelible mark on Basin Harbor. The year that Lenox didn't get his visa, for instance, regular guests felt his absence. "None of us is irreplaceable," she says. "But it's good to have people returning year after year because they know your guests, and your guests know them. They're part of our family - and when a family member is missing, there's a hole." To hear David and Lenox tell it, that familial bond extends to employees from other nations, too. "A lot of people don't know that Jamaicans research deeply to see if a person is genuine or not," David explains. But once he starts interacting with colleagues from other parts of the world, he says, "the bond is there, continually." All things considered, however, David and Lenox will never completely assimilate into the Basin Harbor community. The resort is the quintessence of bourgeois high society, whereas the men earn slightly more than minimum wage, plus tips. Though they're permitted to visit Jamaican friends at other Vermont resorts, such as Stratton, and to attend local church services, they hardly ever do. Guys who work 16 hours a day don't find much time for leisure or travel. Lenox points out that he doesn't take advantage of the worship option because the nearest church of his denomination - the God of Prophecy - is in New York City. These men also inhabit a different world from their more affluent foreign colleagues. According to Beach, about half her guest workers come here under J-1 student visas. They stay only a few summers before moving on to professional careers. And, David and Lenox point out, once the summer ends, the J-1 crowd gets its tax money back. They also note that most of the Jamaicans here are over 25 and work longer hours - hence they don't "party" like the student workers do. They don't get to enjoy the waterfront as much, either. "The Eastern Europeans have a field day in the lake," Lenox says. "I don't know if any Jamaicans would ever go in . . ."
That's not just because of their long hours - the two men admit they're afraid of the murky water. Even after a combined 10 summers at this club, neither has taken a dip. "In Jamaica, you can see 20 feet down in the water," Lenox explains. "There are stories about the lake monster, Champ. I think it's a myth . . . but I don't know what's in there." Swimmers or not, the Williamses have been relatively happy at the Basin Harbor Club. Before arriving here seven years ago, David says, he'd heard Vermont was a "redneck state." Now he asserts with authority, "There are more loving people in Vermont than in Florida." By now, it's no secret that the face of Vermont's unskilled workforce bears little resemblance to the state's overall demographic make-up. Vermont's ailing dairy industry is kept afloat largely by the thousands of mostly undocumented Mexican workers who toil long, grueling hours for meager pay. More legit are the Jamaicans who arrive in Vermont each year as part of the federal H-2A guest worker program to pick the state's apples. Whether it's Guatemalan day laborers hammering on construction sites, Caribbean-born maids cleaning hotel rooms and cruise ships, or Eastern Europeans and Australians making snow and tending ski lifts, foreign-born workers are doing more and more of the state's unskilled, low-wage labor. Thus far, that hasn't been the case in Vermont's hospitals, nursing homes, schools and daycare centers, as it is elsewhere in the Northeast. But the demographics in those sectors could begin to change as well, as the Green Mountain State grapples with a shrinking workforce, an aging population and an exodus of young people seeking higher-paying jobs. According to 2004 projections from the Vermont Department of Labor, many of the occupations expected to grow the fastest in the next decade - medical assistant, personal and home health-care aide, hazardous materials handler and highway maintenance worker, to name a few - require little or no education or previous training. Notable exceptions to this profile include network and computer systems administrator, social worker, substance-abuse counselor, and physical or occupational therapist. But by 2014, many of the hottest jobs in Vermont - i.e., those growing at a rate of 3 percent or more annually - will require little more than short-term, on-the-job training. Seven Days spoke with Vermont Commissioner of Labor Patricia Moulton Powden about how the state is dealing with this trend. Powden, who previously chaired the Vermont Environmental Board and the Natural Resources Board, was appointed by Governor Jim Douglas last August and came to the position with more than 20 years of experience in economic and workforce development. SEVEN DAYS: Is there one industry or sector where you expect a rapid growth in Vermont's foreign labor pool in the next decade? PATRICIA MOULTON POWDEN: To be honest with you, we haven't done any real analysis on that question. Our role in the [guest-worker programs] is fairly limited ... but it's not a state policy to look to foreign workers as a workforce development solution. Our solution is to try to get more Vermonters into jobs. Recognizing that there are occupations and industry sectors that have a hard time finding people - farming immediately comes to mind, as do some of the recreational and resort industries - many times those jobs are not very attractive to Vermonters. We respect that [foreign labor] is a solution that some employers have turned to. But we also respect that it is a solution they don't turn to lightly. There is an expense and administrative process to get these certifications and manage the foreign workers who are coming here. So, I believe that it tends to be an avenue of last resort. SD: Why hasn't the Vermont Department of Labor looked at the impact of foreign workers on the state's labor market? PMP: That's a good question. I don't know . . . We're talking about a total of up to 2500 foreign-worker visas out of a total labor force in excess of 300,000. Again, it's been a lot of relatively low-skilled positions, and, admittedly, there are reasons why we can't get Vermonters into those positions. Obviously, most Vermonters want a full-time job. But it hasn't been something that's floated to the top and been something that we needed to look at. Clearly, the workforce shortage, the out-migration of young people, and specific skills training for Vermonters to fill those jobs have taken up a lot of our attention. We only have limited resources, and it's a matter of putting those resources where the biggest priorities are. SD: Which industries will feel the biggest pinch from the labor shortage? PMP: Clearly, several sectors stand out. Health care, the construction industry and, despite declines in manufacturing, there's still significant demand for skilled labor in manufacturing and certain advanced-technology manufacturing. We think perhaps we're going to see some other sectors that may or may not have challenges as we go forward . . . In health care, we're all getting older. I, for one, want to make sure that there's a qualified nurse working in my nursing home when I'm there. It's simply a numbers game. SD: Is there truly a labor shortage in Vermont, or just a shortage of Vermonters who are willing to work those jobs for the wages, hours and benefits they offer? PMP: That's a very broad question. I think the health-care industry has some significant demands, and some of those positions may not have a significant educational requirement. But a home-health aide still needs to have certain training, compassion and skills, so I don't see those positions being a good solution for a foreign labor force, namely because of the logistics. We've spent a lot of time in the health-care industry in particular... to train more Vermonters to take these positions, and how to design the work so it's more attractive. The challenges we're going to face as our workforce continues to shrink mean that we have to look to more innovative solutions. Yes, some states are picking immigration as a solution. But that's certainly not a policy decision that's been made here in Vermont. SD: What kinds of innovative solutions are being tried? PMP: A lot of different strategies get used, though it's still a struggle. It's not the most glamorous thing in the world to work outside in 20 below zero and haul hoses around and make snow. Neither is milking cows at 4 o'clock in the morning . . . But employers have come up with some innovative solutions and are trying to look at job design, as an example, to keep older workers in the workplace longer, and to get younger workers engaged and into those professions. Some of it is marketing, frankly. I talk to my nieces and nephews, and they say, "Eww! I don't want to stick somebody with a needle." And I say, "Health care is a lot more than direct care, though that's definitely a piece of it." And then they look at their sister, who's a nurse making $65,000 a year, and they say, "Hey, maybe there is something to sticking someone with a needle." SD: Which industries best address their labor shortage? PMP: The health-care industry has done a pretty good job at getting out in front on these issues. And the construction industry. Associated General Contractors of Vermont, in particular, is one of the few trade organizations that has taken a lead in addressing this problem for its members and recruiting more people into the industry. Employers have got to recognize, and I think they do, that we're going to have to develop some new strategies.